When I try to sign into Chrome, I am directed to the OneLogin sign-in page. I enter my OneLogin credentials but I am still not logged into Chrome. This creates a loop between the Chrome sign-in page and the OneLogin sign-in page. How can I sign into Chrome without creating this sign-in loop? This normally occurs after I have been forced to change my OneLogin password. This is a known issue with Chrome. Immediately after updating your OneLogin password, your OneLogin credentials do not match your Chrome login credentials, causing Chrome not to recognize you. You will be prompted to sign into Chrome. Chrome will then redirect you back to the sign-in page of the Identity Provider (OneLogin) even though you have already signed into OneLogin. Chrome developers are currently working to fix this issue. Go to chrome://chrome-signin and enter your email address. You will be redirected to the OneLogin sign-in page. On the OneLogin sign-in page, enter your OneLogin credentials. You will now be signed into Chrome until the next time you are prompted to change your OneLogin password. 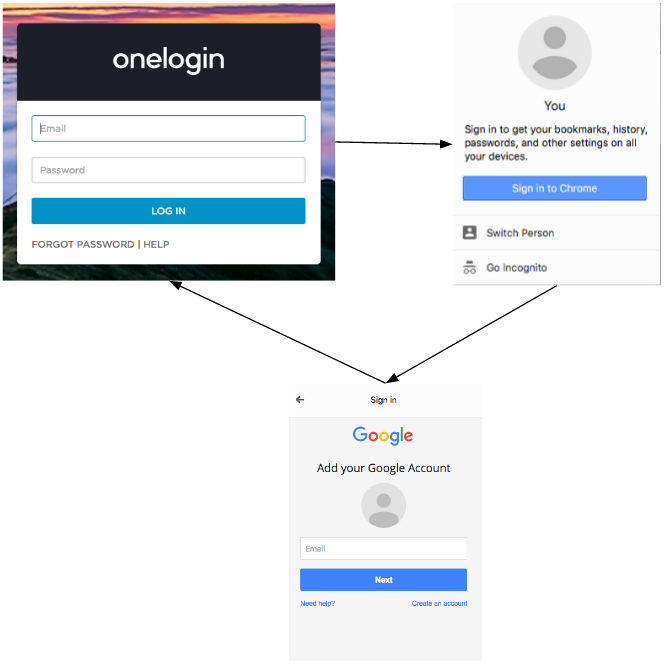 Signing into Chrome with the link provided in step 1 will prevent the sign-in loop between the Chrome and OneLogin sign-in pages. Note: Do not attempt to sign into Chrome using Chrome's user menu. You will receive the message below from Chrome, but this will not resolve the sign-in loop. You can use the link in step 1 at any point during the sign-in loop to sign into Chrome and OneLogin. Always use your most recent OneLogin credentials. Trying to resolve the sign-in discrepancy through Chrome instead of OneLogin can cause Chrome to offer to remove your OneLogin extension. Do not remove your OneLogin extension. 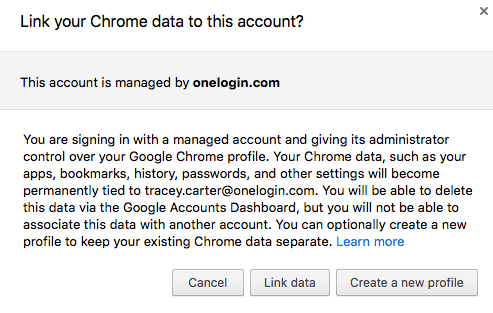 Doing so would destroy the link between Chrome and your OneLogin Single Sign-On.